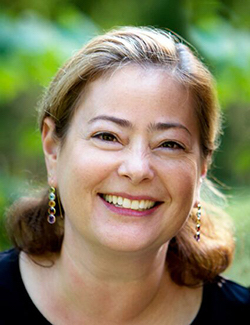 Gennifer Weisenfeld, professor of art history and visual studies, has been appointed dean of humanities effective July 1, serving through June 2019. She succeeds Richard J. Powell, John Spencer Bassett Professor of Art and Art History, who completes his two-year term as dean of humanities this June. Weisenfeld is a specialist in modern and contemporary Japanese art history, design, and visual culture. Her work explores the impact of Japan's modern sociopolitical transformations on artistic production and practice; the cultural formations of nation and empire building; Japanese modernism; the politics of the avant-garde; the visual culture of disaster; commercial design; and the relationship between high art and popular culture. She has authored two books: Mavo: Japanese Artists and the Avant-Garde, 1905-1931 (California, 2002) and Imaging Disaster: Tokyo and the Visual Culture of Japan’s Great Earthquake of 1923 (California, 2012; translated into Japanese, 2014). She co-edited Crossing the Sea: Essays on East Asian Art in Honor of Professor Yoshiaki Shimizu with Gregory P. A. Levine and Andrew M. Watsky (Princeton, 2012). She is currently finalizing The Fine Art of Persuasion: Corporate Advertising Design, Nation, and Empire in Modern Japan. Weisenfeld is completing her second year serving on the Advisory Committee for Appointment, Promotion, and Tenure. She previously served six years as the director of graduate studies for the Department of Art, Art History & Visual Studies. She has been a member of the executive committees for the Graduate Faculty (ECGF) and the Asian/Pacific Studies Institute. Committed to improving learning through new and innovative models of instruction, Weisenfeld is a core author for MIT’s major digital humanities project Visualizing Cultures. She received the university’s Thomas Langford Lectureship Award for faculty excellence. Her work has been supported by organizations such as the National Endowment for the Humanities, the National Humanities Center, the Association for Asian Studies, the Graham Foundation for Advanced Studies in the Fine Arts, the Andrew Mellon Foundation, and the Duke Kenan Institute for Ethics. She is a member of the College Art Association, Association for Asian Studies, and the Japan Art History Forum. Weisenfeld holds M.A. and Ph.D. degrees from Princeton University and a B.A. from Wesleyan University. She joined Duke’s faculty as an assistant professor in the Department of Art, Art History & Visual Studies in 1998.